Police attend after the attack on Waterloo Place. A MAN has admitted slashing a notorious underworld figure following a long-standing feud. David Togher attacked Sean “Lugs” McGovern in front of horrified onlookers in Edinburgh city centre last July. The 32 year-old was set upon in broad daylight moments before he was to return to jail from home leave. McGovern is currently serving 17 years for a pub shooting and drug crimes. Togher and his mystery accomplices fled the scene leaving a blood soaked McGovern slumped on the street. But, the 31 year-old helped get himself caught after being clocked buying distinctive cycling gear worn during the attack. He was today locked up for six years after he admitted assaulting McGovern to the danger of life. A judge heard how McGovern refused to help police – but Togher’s QC said there had been “historical” bad blood between the men. Ex-squaddie Togher was previously jailed in 2009 for his part in a major drugs gang in the capital. He added the slashing was “pre-meditated and calculated”. McGovern had been at the end of a week’s home leave from HMP Castle Huntly when he was attacked on July 27. His girlfriend Jade Cameron dropped him off in Edinburgh’s Waterloo Place around 12.30pm and he was set to board a G4S security vehicle back to jail. But, as he got out his lover’s Mercedes, Togher and an accomplice raced out of a stolen Skoda car towards him. It is thought they had followed McGovern that day. 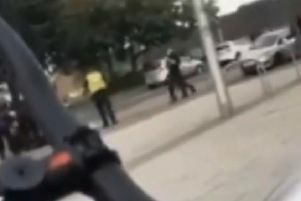 Prosecutor Bernard Ablett told the High Court in Glasgow: “Both were wearing cycling tops, gloves, caps, sunglasses and snoods partially covering their faces. Mr Ablett added McGovern was then “quickly” struck on the head and face with the blades. Amid dramatic scenes, Togher and his friend sprinted back to the Skoda with the driver still behind the wheel. They could be heard yelling ‘open the f***ing door’ as McGovern briefly gave chase. The duo jumped in the car and fled the scene. McGovern’s girlfriend went to his aid as other passers-by came to help. He was covered in blood with injuries to his neck, face and hand. The stolen getaway car ended up torched near a cycle path in the capital’s Duddingston area. Police later got an anonymous call that Togher, of Bonnyrigg, Midlothian, was involved. His home was later raided, but he was not there. During the probe, officers then studied the “distinctive” tops worn by Togher and his accomplice. They were found to be sold in Halfords stores. It was discovered these cycling clothes along with snoods and a black headband had been bought at a branch a week before the attack. Togher was eventually held on August 8 at a caravan park in East Lothian – but he made no comment to the allegations. McGovern meantime was treated for a number of wounds including one which went to the muscle in his left hand. But, medics believe he should make a full recovery from his injuries. Togher’s QC Mark Stewart later told the court: “He makes no bones about it...he had a historical difference with Mr McGovern that lead to this incident. Lord Turnbull told Togher the jail term would have been eight years, but for the guilty plea.